St. Germain Town Chairman Tom Christensen explains the project to town electors in the Community Center. 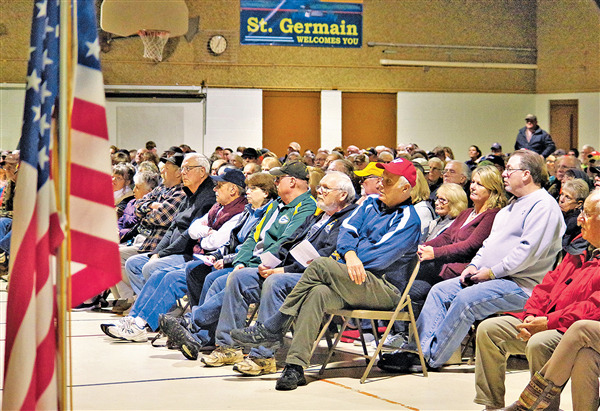 Town of St. Germain electors defeated a building project last Tuesday that called for the demolition of the Red Brick Schoolhouse and the present Community Center, and the construction of a new community building at a total cost of nearly $4 million. The first question on the building proposal presented to electors was defeated with 292 “no” votes and 96 “yes” votes. The defeat of the first question made the remaining questions moot as the board also sought permission to increase the cost of the project by adding features to the proposed project, and approving the funding for the project. The additional questions would have allowed electors to increase the cost of the project by adding a generator large enough to operate the electrical systems in the building during an emergency ($77,000); adding exterior stone veneer ($41,107) and adding a standing seam metal roof ($137,050) to the project. These items had been removed from the first question to keep project costs below $4 million at $3.99 million. Funktion Design Studio LLC of Wausau assisted the town in planning the proposed 14,000-square-foot community building. In the end, questions two and three failed as well with question two losing 89-285 and question three failing 67-307. It’s the second time this year that electors rejected a building plan, with the first $6.8 million proposal failing in August on a 100-403 vote. In that plan, the Red Brick Schoolhouse would have been demolished, but the Community Center would have been utilized and would have included an addition. 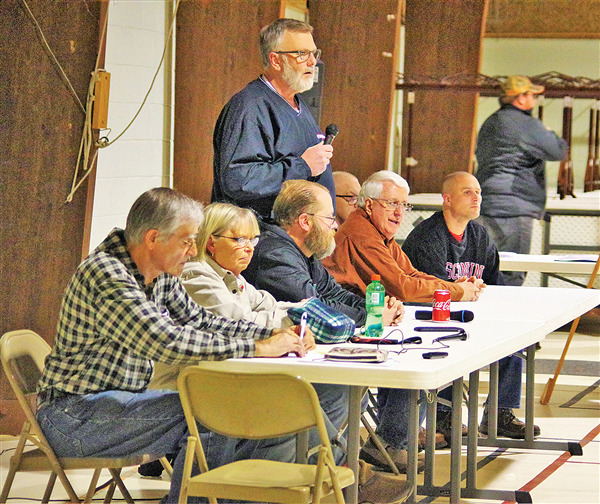 A discussion on what the town board’s next step might be could happen at the next town board meeting Monday, Nov. 12, at 6:30 p.m. in the Community Center. The board and town electors will be meeting again Wednesday, Nov. 14, for the annual budget meeting to approve the property tax levy and town budget for 2019. That meeting will be at 7 p.m. in the Community Center. The town board is proposing a $1.534 million budget for 2019, up 5.45% from the $1.455 million budget for 2018. The proposed property tax levy will be $899,062 for 2019 operations, up 0.35% from the 2018 levy of $895,930.